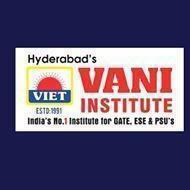 Vani Institute is one of the Top GATE Coaching Centres in Kochi. Offers a well-structured classroom coaching program for GATE| ESE exam in the disciplines of Electronics And Communication, Electrical, Mechanical, Computer Science and Information Technology, Civil, Instrumentation, Production and Industrial Engineering. Vani Kochi conducts classes in Engineering Entrance Coaching, Engineering Training and Public Sector Undertaking Exam. It is located in Kaloor, Ernakulam. It takes Regular Classes- at the Institute.